Short International brings us a diverse collection of animations, documentaries and film shorts from 4 continents. Although the presentation itself is well conceived and impressively constructed, the elements themselves are uneven and a couple of them are, well, downright snoozers. The Fly is a beautifully drawn, moving illustration that leads us from an autumn wood into the warmth and shelter of a nearby home, through the eyes of a fly. Flies, however, are rarely welcomed guests - . Presented full frame and includes production notes. Note: The soundtrack literally made me nauseous both times I viewed this excellent short, 3 days apart! The directors describe this short as an "animated archive film/parody." Quickband obviously defines it as animation. Personally, I think the award it received at the Seattle Underground Film Festival describes it perfectly—"Best Experimental Film." Not quite an animation, Boulanger & Koscielniak have directly manipulated 60's Chinese Propagandist newsreel footage in various ways to skew the slant of its message. Although the effect achieved is mildly interesting, this reviewer does not get their "new" message and leaves it in the category of "experimental": try again. In full frame presentation with production notes. Tiny Sunbathers was previously included on Short 9: Trust, more generously reviewed by Mark Zimmer here. This stark and stunning entry loosely visualizes Edgar Allen Poe's dark classic poem of the same name. Styled like an Expressionist woodcut, this passionate piece also serves as homage to that powerful German medium, echoing the graphical work of Kirchner and Heckel. Available in both German and English readings by Hans Paetsch and a powerful score by Eckhardt Gadow. Widescreen presentation. Includes production notes and a proud (but hesitant in English) commentary by Rall. Der Rabe was previously included on Short 9: Trust, also appreciated by Mark Zimmer here. A delightful pictorial that uses claymation, rice/kozo papers and a variety of objects to bring us Korea through the seasons (including rabbits making ricecakes on the moon!) As colorful as most traditional arts & crafts of Korea, with an excellent soundtrack that includes traditional themes. Erroneously titled Images of Korea in the menu, this full frame selection also includes a director's commentary and production notes. Previously included on Short 7: Utopia, also reviewed by Mark Zimmer here. A look at the global hip hop culture, El Muhajir travels to Japan, England, Germany, The Netherlands, France and Cuba, discovering that the genre finds expression in diverse social structures. Although centered around music, it really belongs in the documentary category. Captured on handheld digital video, the colors are washed out and the images are raw, rough and mostly difficult to watch with noise and edge enhancement visible everywhere. Includes an interview with the director and production notes. Full frame. An original production of Circuit, the music arm of Quickband, this short is, again, an interview/documentary featuring Gerry Arling and Richard Cameron, a Dutch music duo. Accompanied by a second feature, Imaginary Films (06m:20s), neither piece presents a single, entire composition. There are snippets of their music throughout, but it was difficult to grasp what it is they do, as I am unfamiliar with their work. We mostly see these products of pop culture lounging in bean bag chairs, espousing certain themes and "philosophies" that made me feel empathy for how they will view this 10 years from now. At one point Cameron claims one of their songs "doesn't sound arty" and he's right—they all do, and he does as well. A few more words from Arling might have lent more depth to these two pieces, as he seems the quiet, more thoughtful of the two. Full frame image includes production notes that paint a better picture of Arling and Cameron than they do themselves. Burnout is part music video, part short film and an official selection of the 2000 Sundance Film Festival. We follow along from the POV of a weary semi driver as he enters a truck stop in a rainy twilight. The centerpiece is a mournful tune, in a style more-than-reminiscent of Tom Waits, and oddly, the song's performer, at his piano, is the centerpiece of the café, although no one there seems to notice him. 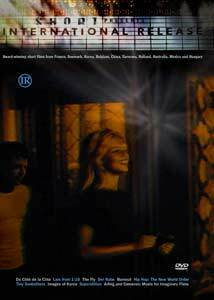 In his commentary, Barbey explains that it was meant to be completed in one shot, and he was successful for the most part: from the time the driver's feet hit the pavement to the time he exits the café is all done in one swirling, handheld take. This is presented in widescreen with an interesting director's commentary and production notes. "Crocodiles will inherit the earth, turning husbands into furniture." Superstition is a successful multimedia extravaganza of digital graphic and typographic elements over and around a wild split-screen effect of the central film image and a fabulous audio overlay of hot Latin music with various voiceovers in Spanish and English. The Gout Brothers present an exciting, visionary celebration of a Mexican folk motif featuring the crocodile, creating this piece with dazzling results. This full frame presentation also offers a slide show of static images made in conjunction with the short. Storyboards and production notes also accompany this intriguing film. Previously included on Short 7: Utopia, not-so-happily reviewed by Mark Zimmer here. Acclaimed director Agnés Varda created this affectionate, mischievous postcard of the Côte d'Azur that is presented in French without translation or subtitles. If you can follow the narrative (juste un peu, comme moi), so much the better. If not, please do not pass this by—the sights and sounds of these French seaside resorts as they were at mid-century are a treasure, and with the rampant growth in the last few decades, some are never to be seen again. As you watch, you might just find the charming team voiceovers of Roger Coggio and Anne Olivier enhance the images and broaden the experience as they blend into the soundtrack. From Nice to St. Tropez, roman ruins to beach umbrellas, the baroque to Matisse, Varda's lens doesn't miss a duality, and her short thrives on the juxtapositions as much as La Côte itself does. Original full frame aspect ratio with production notes. In her commentary, Sophie Fiennes (sibling of Ralph And Joseph) claims to have awakened one day in L.A. to realize she was jaded by her celebrity interviews and, needing to be "frightened," decides to seek out her favorite director, Lars von Trier (Breaking the Waves, Dancer in the Dark). Von Trier restricts himself to a dogmatic style of filmmaking, and Fiennes takes us back to school to learn his top ten rules. An official selection of the 2000 Sundance Film Festival, this interview is followed by both the director's and the producer's (Shari Roman) commentaries as well as production notes. This short is full frame, however the clip from Breaking the Waves is presented in its original 2.35:1 aspect ratio. As with others on this disc, Lars from 1-10 was previously included on Short 7: Utopia, reviewed by Mark Zimmer here. Image Transfer Review: The visual content is as diverse in quality as content. Aspect ratios noted above. The animations are all clean with colors in their intended ranges; no visible anomalies that should not be there. Stylistically, Der Rabe is superior, while Image of Korea gets high points for charm and invention. The 2 music entries are not as enticing. Hip Hop, as mentioned above, has all the markings of its handheld digital source as stated above, with interior scenes almost unbearably too bright or too dark; the outdoor shots are a bit better. The 2 segments on Arling and Cameron (apparently shot as one piece and later divided—weakly—by "content") suffer similarly to Hip Hop, although this time the camera seems to be in more capable hands. Both entries in the fiction category were beautifully rendered at the source and the transfers are excellent. Burnout has distinct, natural colors that lean a bit dark through the exterior scenes and are brighter, if a bit red, once we are inside. No dust or dirt, a very clean image. Superstition is intended to be over-saturated and conversely washed out in places, all under the director's control. An equally perfect transfer. Du côte de la côte, the oldest entry in this collection, suffers only slightly from the ravages of time, so is in fine condition overall. A few random pinholes and occasional softness does not deter from enjoying this travelogue. Colors are naturally vivid and the source print, obviously cherished, makes for a top-grade transfer. Finally, Lars from 1-10 also falls prey to the pitfalls of video: soft, shimmery, with exposure difficulties throughout, although under the right conditions, the colors are balanced and natural. Grade below reflects the overall average. Audio Transfer Review: Again, the audio varies with the different selections, from DS2.0 to DD5.1. Sadly, the only difficult piece is in the English version of Der Rabe: while the original version was built around the German reading, which is balanced and effective, the English track was dubbed in much later and the balance between the voiceover and the soundtrack is annoyingly uneven. A version in German, subtitled in English would have been quite preferable. The audio highlight for me comes in Superstition, which is an exciting 5.1 mix that makes use of the entire soundstage with haunting and evocative efficiency. Extras Review: Quickband should be proud of their work on the digital presentation of Short International. Their creative introduction and menu montage is as professional and interesting as any I have seen. Easily navigated and quick-responding, it makes for a cohesive interface to the random and varied content. The audio loop is lovely if a bit irksome (not seamless) and the simulated handwritten typeface is a little difficult to read at first, but I quickly recognized the more difficult letterforms and sailed smoothly from then on. Extras included for individual shorts are listed above in the content review above. A rough mix of ranging genres, like any compilation, can be labeled as "something for everyone." While some failed to engage me, it might be the very "must have" for someone else.